As a SCUBA diver for Jacques-Yves Cousteau aboard the legendary ship Calypso, I was constantly inspired by the Captain. Dinner conversations often included talk of technology, the ocean and space. Yes, space. Cousteau likened SCUBA to what he termed “inner space”. He yearned to leverage the technology and intelligence that America’s space program could provide. Thus Cousteau formed a tight bond with NASA; it’s Deputy Administrator Dr. George Low and Rusty Schweickart, Apollo 9’s Lunar Module Pilot. Surely, technology alone will not do all of this nor will it save us. Man must execute. Technology must be used in positive value-added ways, coupled with public policy, law, economics and sensible human behavior. Water; is it an afterthought for man, thought to be an endless resource and convenient cesspool? How is it that we can leverage technology to exploit it, e.g. catch unfathomable quantities of fish plus wasteful bycatch, while at the same time ignore leaking radiation, plastic garbage patches and God knows what else. Cousteau, the man who took us below the surface of the ocean and into the undersea world fought for a Law of the Sea and so many global and local causes. His insatiable curiosity and desire to communicate inspired a generation. As Cousteau worked with NASA he sought the intelligence that remote sensing, e.g. an eye in the sky could provide. Cousteau’s joint venture with NASA and Texas A&M University used Calypso as a platform to gather ground truth information, e.g. water samples throughout the Gulf of Mexico. This data was correlated with NASA’s then new Earth Resources Technology Satellite (ERTS), subsequently renamed Landsat. Landsat 1 used an oscillating mirror that scanned the earth and a telescope that focused visible and near infrared light waves reflected from the earth into the satellite’s radiation detectors, which measured the light intensities of 1.1 – acre picture elements, or “pixels “in four different spectral bands… Talk about technology! … The values were then converted into computer-digestible numbers and transmitted back to earth at a rate of 15 million units per second. Using an electron-beam recorder, the stream of data became imagery on photographic film, which in turn was used for a variety of uses. Today Landsat 8 is above us and the program represents the world’s longest continuously acquired collection of space-based remote sensing data. Four decades of imagery provide a unique resource for many, including those who work in agriculture, forestry, geology, hydrography, oceanography, mapping, and global climate change research. If Cousteau were still with us, he’d be intrigued and no doubt have ideas as to how his team along with NASA could further leverage today’s technology. Of course he’d be saddened, dismayed and surely vocal about the current state and lack of support for NASA. “The supreme imperative of man today is to conserve, to protect, to nurse the water system of our planet; because its fate is our fate. Remote sensing is but one example of using technology in a positive way. Jacques-Yves Cousteau said, “Protect what you love”. 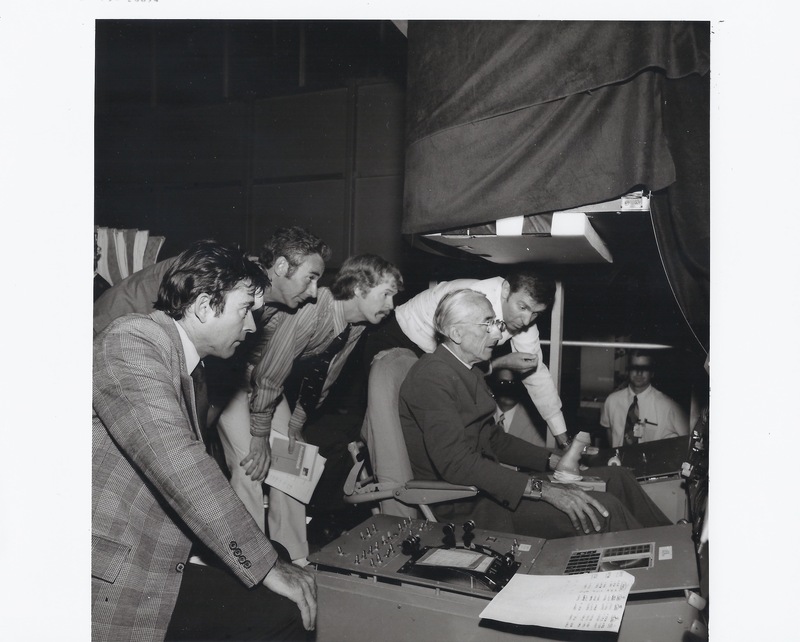 Second from left is Fred Hyman, third from left is Rusty Schweickart, sitting is Jacques Cousteau.